Stock status is current as of 4/26/2019 4:04 AMET. 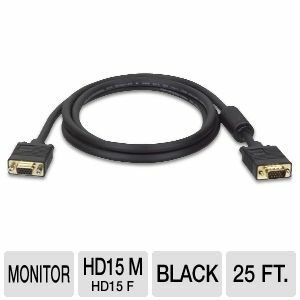 The lengthy cable that you are looking for is here in the Tripp-Lite P500-025 VGA Monitor Extension Cable. The 25-feet extension cable is the solution for connecting your equipments that are far from each other. Buy the Tripp-Lite P500-025 VGA Monitor Extension Cable now and achieve convenience and flexibility in your cable connections.